This week our residents have been casting on, slipping and passing over. What on earth are we talking about? Of course those of you who are keen knitters will recognise the terminology. For those of you who aren’t, please don’t ask us to explain! What we do know is that a group of our lovely ladies thoroughly enjoyed themselves knitting various items. The knitting is also very good therapy, helping in maintaining both physical and mental dexterity. We hope to bring you photos of the results of their labours in due course. 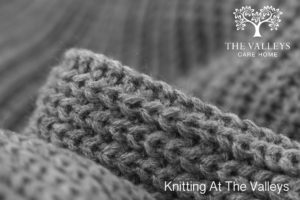 I the meantime….keep Knitting!